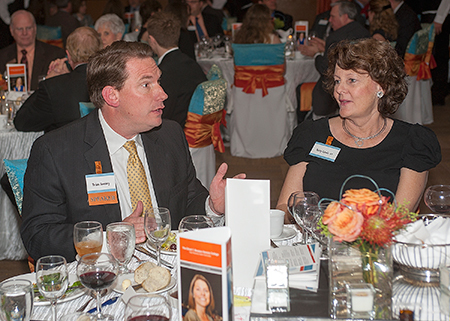 Sam Houston State University will host its eighth annual “Let’s Talk!” scholarship benefit event on March 19, beginning at 6 p.m. in the Lowman Student Center Ballroom. “Let’s Talk allows guests to be active participants in discussing a predetermined topic for their table, facilitated by a notable conversation leader, while enjoying an elegant multi-course dinner and fine wine. This year’s topics will range from healthcare, education, crime, and entertainment to pop culture, politics and innovation,” Angel said. Among the discussion leaders are: Wheeler Avenue Baptist Church founding pastor Bill Lawson who worked with the Rev. Martin Luther King Jr.; former National Security Administration code-breaker Gayle Fallon; FBI special agent Daniel Fuentes; Texas Central Railway president Robert Eckels; traumatic brain injury survivor Patti Foster; ironman triathlete Leo Bourgeois; and State Board of Education chairwoman Barbara Cargill. A list of confirmed speakers and topics is available online at shsu.edu/letstalk. Guests are encouraged to reserve tickets early to receive priority considerations for their first, second and third choices. Tickets for the event are $125, a portion of which is tax deductible. Reservations can be made online at shsu.edu/letstalk or by calling 936.294.4061. Sponsorships are also available.